Thomas Robert Macquoid (1820–1912) was a prolific artist whose work included painting in oil and watercolour, book illustration and designs for book-covers. Born in Brompton, London, he lived his entire life in the capital where he built a modest but successful career. He trained at the Royal Academy and became a member of the Royal Institute of Watercolours and the Royal Institute of Oil Painters; he is also listed, from 1849–52, as an ARIBA, or Associate of the Royal Institute of British Architects. He may have prepared architectural drawings for specific buildings; he certainly contributed to text books on architectural ornament and his primary subjects as a painter were in the same field. Little is known of Macquoid’s personal life beyond these bare facts, although it is interesting to note that he was part of his talented family. His wife Katherine Macquoid was a novelist and travel writer whose work appeared with illustrations by the artist in the later years of the period; and his son was Percy Macquoid (1852–1925), an illustrator, furniture designer, critic, and designer of theatrical sets. The family lived in a well-appointed address in Chelsea and Macquoid seems to have moved in elite circles. He corresponded with the musician Sir George Grove (Royal College of Music, London), with Robert Browning (Baylor University, Texas), and with Thomas Hardy, whom he quizzed about aspects of Tess of the D’Urbervilles when it was published in 1891 (Hardy, Collected Letters, 1: 245–6). There is otherwise only scant documentary evidence of Macquoid’s family life or personality. Correspondence with the publishers Macmillan and Co. suggest a hard-nosed approach to business arrangements (British Library, London) and a note to the engraver Joseph Swain while looking for work has a similar tone (Private Collection). His outspokenness is likewise suggested in a letter from Rosalind Birnie Philip to Charles Freer, the American industrialist and founder of the Freer Gallery in Washington DC (Whistler Correspondence, Glasgow University). Reporting on an exhibition of silver which was being guest-curated by the artist at the Fine Art Society, London, in 1902, Birnie notes the curmudgeonly behaviour of a ‘certain Mr Macquoid’ who constantly complains about the displays and intimidates everyone in the room with his loud and ‘objectionable voice’, his strange appearance – including a blind eye, eyeglass and fur-lined coat – and his flouncing out of the room when he fails to get his own way. This is probably an unsympathetic report of Macquoid in his eighty-second year, but it also suggests his energy and exacting nature, as well as his versatility. Macquoid had made a living in the dynamic art-market of the time and like so many of his contemporaries had been forced to diversify to survive. He exhibited 253 paintings at the Royal Academy and other London-based venues, where his specialism is recorded as ‘churches’ (Graves, 181), and was constantly employed as a ‘draughtsman on wood’, creating a variety of decorative borders, topographical, historical and architectural scenes, labels, visiting cards, and advertising material. 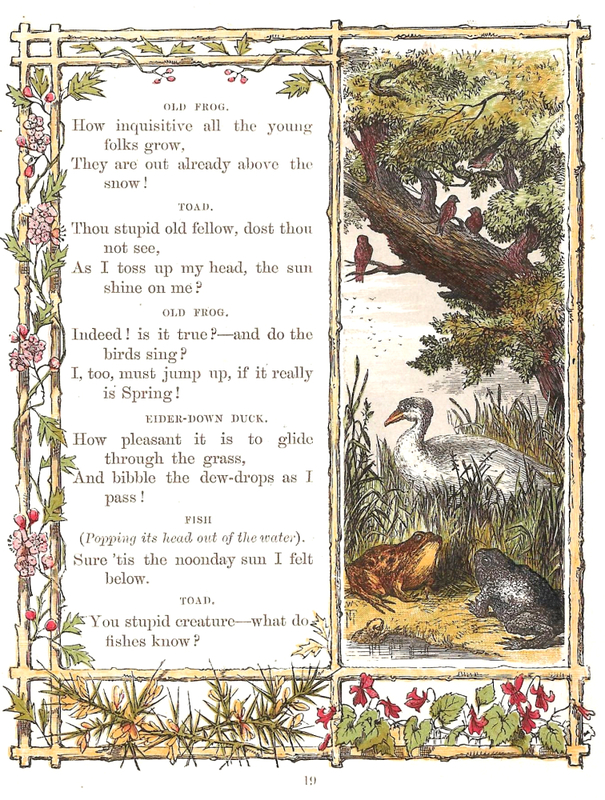 Though mainly a contributor to illustrated books, he illustrated a number of books as the sole artist, among them Little Bird Red and Little Bird Blue by Matilda Betham-Edwards (1861); he also published a range of images in periodicals such as The Welcome Guest, to which he wife contributed, The Illustrated London News, The Graphic, Good Words and Once a Week. Other work appeared in a number of gift books, among them Favourite English Poems (1859) and The Merrie Days of England (1859). Some of his best illustrations featured in a series of re-issues of classic fictions, notably Robinson Crusoe(1863–4) and Uncle Tom’s Cabin (1853), which were produced in conjunction with George Thomas. Campbell, Thomas. Gertrude of Wyoming. London: Routledge, Warne, and Routledge, 1862. Head and tail pieces. Defoe, Daniel. Robinson Cruscoe. London: Cassell [1863–4]. 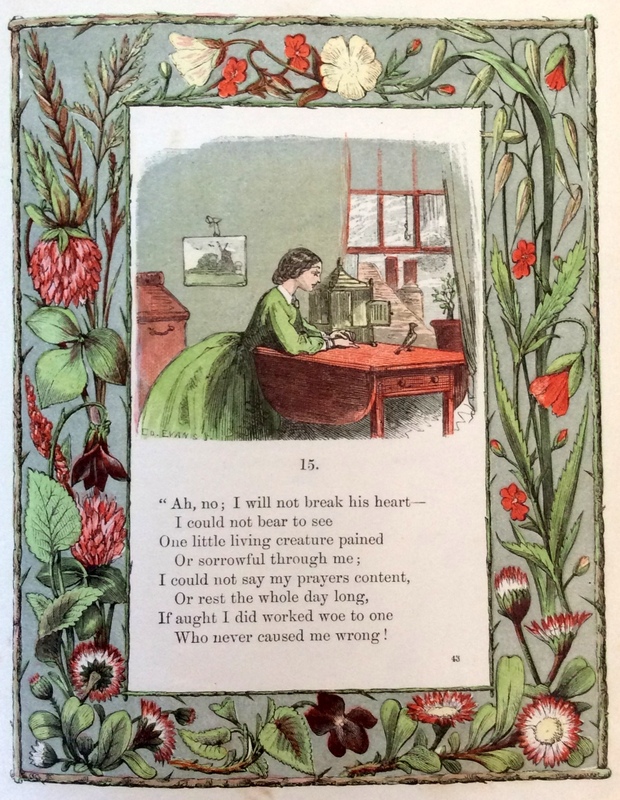 Illustrations and borders for illustrations by George Thomas and a number of others. Edwards, M. Betham. Little Bird Red and Little Bird Blue. London: Sampson Low, Son & Co., 1861; American edition, New York: James G. Gregory ; later edition, London: Routledge, 1883. Illustrations and borders; both editions have covers designed by Macquoid. Edwards, M. Betham. The Primrose Pilgrimage. London : Griffith and Farran, 1865. Edwards, M. Betham. Snow Flakes and the Stories They Told the Children. London: Sampson Low, Son & Co. . Ornamental borders and cover; others by H. K. Browne. Examples of Architectural Art in Italy and Spain. London: Thomas McLean (1850). Examples of Ornament. London: Bell & Daldy. 1855. Architectural drawings. Favourite English Poems. London: Sampson, Low, Son & Co (1859). Illustrated borders. Good Words. London: Strahan, 1860–70. Ornamental borders. Macquoid, Thomas and Katherine. About Yorkshire. London: Chatto & Windus, 1894. The Merrie Days of England. London: William Kent, 1859. Initial letters, head and tail pieces; illustrated by Birket Foster. Stowe, Harriet Beecher. Uncle Tom's Cabin. London: Nathaniel Cooke, 1853. Initial letters and borders for illustrations by George Thomas. Voyage of Discovery and other Stories, selected from Peter Parley'sAnnuals. London: Ben George .